Heartburn is usually worse at night preventing many of us from getting the sleep we need. By the end of the day, stresses of our hectic lives, anxious thoughts, and stress of work and family have built up and weigh heavily on us. These stresses cause greater sensitivity to stomach acid. Stomach contents also press against your lower esophageal sphincter (LES) when you lay down increasing the possibility of acid reflux. 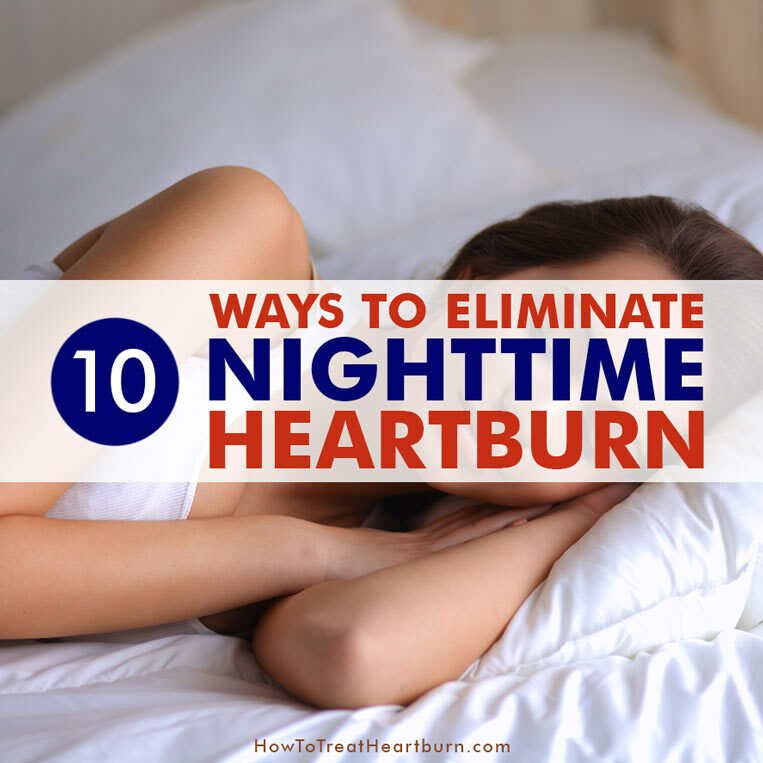 The following are 10 proven ways to lower or eliminate the risk of nighttime heartburn. 1. Avoid heartburn trigger foods. 2. Eat slowly and chew properly at your evening meal. Putting down your utensils between bites can help us slow down. Eating slower helps with the digestion process and gives the body time to know when it’s full. Being too full will cause pressure on the LES leading to acid reflux. Taking time when eating, allows us to savor our meals giving us a sense of satisfaction. Savoring meals helps us de-stress (point 5) and over time taking in fewer calories will help us achieve weight loss (point 10). 3. Fast for 2 or more hours before bedtime. Fasting will allow the stomach contents to move along through the digestion process and eliminate possible pressure on the LES when laying down. Reducing pressure on the LES lowers the risk of acid reflux. 4. Medications both OTC and prescription can contribute to or cause heartburn and acid reflux. It’s best to consult your doctor about your heartburn issue and treatment options that might not contribute to your heartburn and acid reflux issues. Some medications taken at night might better be taken in the morning or hours before bedtime to reduce the chances of contribution to heartburn and acid reflux. 5. De-stress in the evening. There are many great relaxation techniques that can be practiced to de-stress from the ordeals of daily life. 6. Wear loose clothing around your waist and stomach. Many advocate sleeping naked for multiple health reasons. This is one. 7. Sleeping on your left side can reduce heartburn symptoms. Due to the shape and position of the stomach and digestive tract, lying on your left side causes your stomach to hang lower preventing your stomach contents from placing as much pressure on the LES. Sleeping on the right side adds to acid reflux issues by adding pressure on the LES. Again, this is because of the shape and position of the digestive tract. 8. Sleep with your head and torso elevated upward. Gravity can be your friend or enemy. Staying elevated helps reduce pressure on the LES and lowers chances of acid reflux. Raising the head of your bed with six inch blocks should give a satisfactory angle. Other options are to sleep on an acid reflux pillow system (wedge pillow system) or a mattress bed wedge. 9. Don’t have a nightcap. Alcohol aggravates heartburn symptoms. 10. Lose weight. Excess weight places pressure on the LES which can cause it to open and even weaken over time. Failure of the LES to close properly will cause acid reflux.